Elk are beautiful creatures known for their large antlers and equally large body size. In fact, they are one of the biggest land mammals in all of North America. 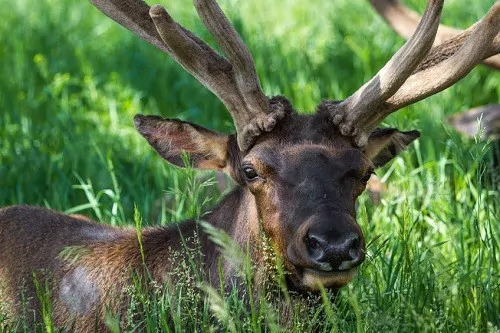 This may make it tempting to watch or even approach a herd of elk, but you need to be aware of the fact that elk are dangerous wild animals that you need to be wary of. Elk are aggressive animals. Females can be particularly aggressive in the spring and males during the fall, but both are dangerous year-round. The best way to keep from being charged by an elk is to avoid attacks in the first place. 1. If you see elk, then keep your distance. The general rule of thumb is to stay at least 3 bus lengths away from them. Any closer and you may agitate them and provoke a response. 2. Before deciding to charge, elk will likely display nervous signs such as teeth grinding and pointing their ears. This is your chance to back off, so take it. 3. If you see elk near the road, then do not get out of your car to take pictures. Take a few shots from safely inside your vehicle if you want, and then move along. If you make a mistake and break one of the above rules, or if you just happen to stumble upon an elk that is feeling very aggressive that day, then the elk may take a charge at you. If this happens, then do not stand still, do not consider playing dead, and do not try fighting back. You need to seek shelter behind the nearest solid object, such as your car or a tree. If the elk cannot take a straight charge at you, then there is a good chance it will back off.